Many of us show affection for our dogs by “treating” them with food. Treats let us nurture the bond we share with our pets as well as reward desired behaviors during training. Because food treats play an important role in our pets’ diets, Diamond Pet Foods is introducing six new varieties of Diamond Naturals Dog Treats. These treats are made with only high-quality ingredients and are the perfect choice for discerning dog owners who want a premium treat without the premium price. Like us, dogs love treats too. But too many treats can lead to excessive weight gain and a nutritionally unbalanced diet. Read on to learn more about new Diamond Naturals Dog Treats and how they fit into a complete and balanced diet. Then head over to our Facebook page and enter to win a Diamond Naturals gift basket filled with a 16-ounce bag of treats, Double Doodie Bag, microfiber towel and collapsible bowl. What should I consider when selecting a dog treat? Beyond those factors, look for treats made with high-quality ingredients, just as you would for your pet’s everyday food. Treats can be used in moderation alongside a complete and balanced pet food. Treats are just that — a treat. Since it can be easy to overindulge your dog, you’ll want to limit treats to no more than 10 percent of your dog’s total daily calories. If you’re not sure how many calories your dog needs daily, be sure to talk with your veterinarian. Your veterinarian can calculate your pet’s calorie needs, then determine how much food and how many treats you can feed to avoid obesity. You can also refer to the feeding guide found on the treat package. It lists the recommended maximum number of treats you can feed daily without compromising your pet’s nutrition. What makes Diamond Naturals Dog Treats healthy? Diamond Naturals Dog Treats are made with only high-quality ingredients, including whole grains. What you won’t find in these tasty biscuits are corn or wheat — ingredients that are potential allergy triggers. While they are made from wholesome ingredients, Diamond Naturals Dog Treats do not meet your dog’s complete nutritional requirements and should not replace his normal dog food. What flavors and forms of Diamond Naturals Dog Treats are available? Diamond Naturals Adult Dog Treats are available in four flavors: chicken, beef, lamb and peanut butter. Treats for puppies and large breed dogs are available in chicken flavor. The crunchy biscuit form of Diamond Naturals Dog Treats help keep your pet’s teeth clean. What makes Diamond Naturals Large Breed Dog Treats different from the other varieties? 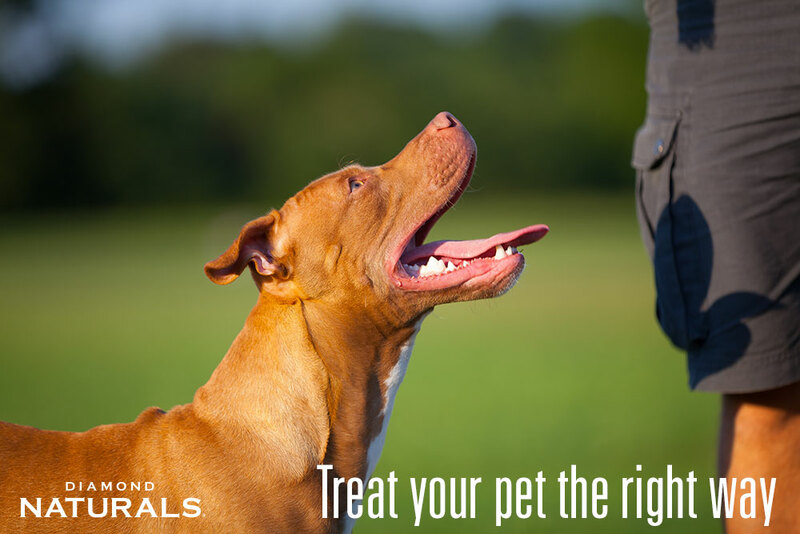 Two characteristics distinguish the Diamond Naturals Large Breed Treats from the adult formulas. First, the biscuit size is larger compared to our other treats. And second, the large breed treats include glucosamine to help support joint health. Head to the Diamond Pet Foods Facebook page to enter our gift basket giveaway, which ends June 12, 2016. You could win a basket filled with Diamond Naturals Pet Treats and other goodies for treating your dog!